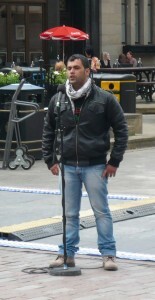 On the weekend of 9th June 2012, Tayside for Justice in Palestine, Scottish Palestine Solidarity Campaign (Dundee) and Action Palestine, held a number of events in Dundee to campaign for a wider understanding of the situation facing the Palestinians who are subject to a long-standing brutal Israeli military occupation. 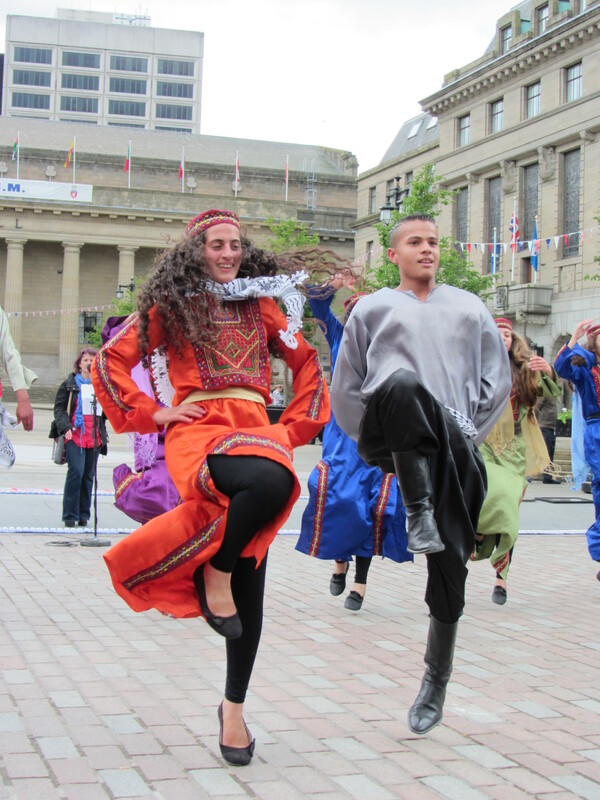 On Saturday 9th, we brought the story of Palestine to Dundee City Centre, drew large crowds and had a wide variety of speakers and performers. The audience loudly applauded the young Dabke dancers from the Lajee Cultural Centre (Aida Refugee Camp, Bethlehem). They listened attentively to the many thought provoking explanations and experiences they heard. Stallholders engaged visitors in dialogue about the products of Palestine, its history and its current predicament. On Friday 8th there was a performance of Still Life –Tales from the West Bank. Karen Chalk and Penny Stone, two women who had served in Palestine as human rights observers, told the story of occupation through an hour of song, stories and images. On Saturday evening, Action Palestine organised a public meeting about Palestinian political prisoners at the University of Dundee. Mohammed Alazraq and Salah Alajarma described from their personal experiences the inhuman conditions that Palestinian political prisoners experience in Israel’s gaols. They detailed how the struggle against the Israeli occupation continued in the prisons and how the prisoners maintained their dignity in the face of such brutal treatment. On Sunday at Dundee’s WestFest event, the Lajee Cultural Centre had a stall and distributed information about their project and its aim of giving children in the Aida refugee camp a safe place to play and be creative. On Monday at Craigie High School, the Lajee Dabke troupe met children and young people of their own age. 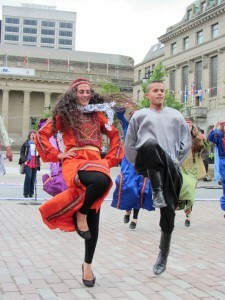 As part of the school’s Global Citizenship studies, they described their experiences as refugees living in a Bethlehem refugee camp and performed their dances for the Craigie pupils. Over £1,000 was raised to help fund the Lajee Cultural tour of the UK and to contribute to our future campaigns fighting for justice for Palestine. This money was raised through collections at the EIS conference, Dundee Central Mosque, Dundee’s WestFest and the festival in the City Square. Donations were also made by trade unions, including the GMB, Unison and UNITE and the Communist Party of Scotland (Dundee). We are very grateful to all who supported these events through their participation, preparation and generosity. It bodes well for our objectives of reaching a peaceful and just resolution to the occupation of Palestine. Throughout these events, stories of despair were balanced by stories of hope with actions that everyone in Dundee can take as part of our contribution to achieving Justice for Palestine. 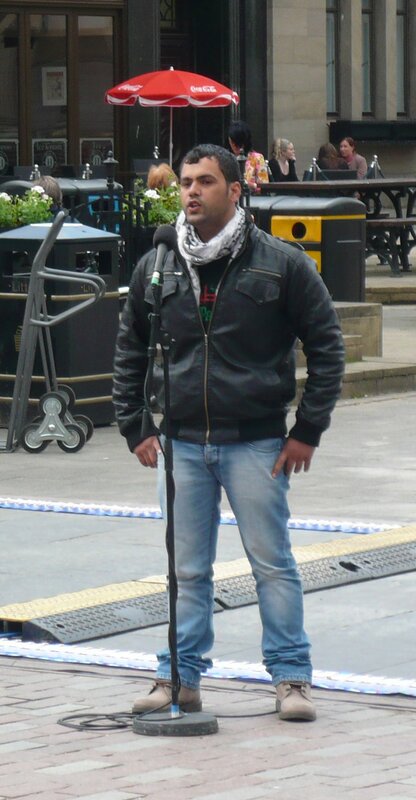 This entry was posted in Dundee, Events, Occupation, Prisoners, Uncategorized and tagged Dundee University, Gaza, Lajee, Occupation, Palestine, Prisoners, SPSC. Bookmark the permalink.